Would you like to put your home handyman skills to the test this Halloween by learning how to make your own Halloween props? 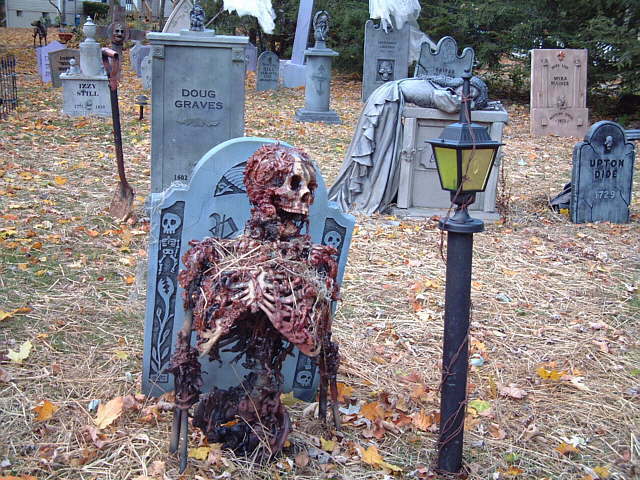 If you’re the DIY type and you enjoy scaring the kids at Halloween, I’ve ‘dug up’ some great links to all sorts of scare the pants off of ’em yard props and ‘killer’ decorations that you can build yourself. I’m talking about skeletons, torsos, hands, flying crank ghosts, skulls, zombies, spooky audio effects, lighting and fog techniques (some very detailed), demons, gargoyles, and all types of creatures & devices! Some of these Halloween props are simple enough for beginners. Others are rather involved, but well worth the fun of building them yourself for a fraction of the cost of store-bought Halloween decorations. Come along as you prepare to greet your guests properly for Fright Night! Many of the following links to DIY Halloween props will show you step-by-step how to create some awesome homemade stuff — many times with ordinary materials that you’ll find around your home, at the home improvement store, hardware store, and at art supply stores. If you want creative ideas for homemade props, then I think I can help you out. All you need to do is take notes and prepare for a little trial and error. Whatever you decide to build, try it out and give yourself enough time to work out the kinks in preparation for Halloween night. Let’s start off with a link that shows how to make monster mud from Terror Syndicate. Monster mud can be applied like paint to your Halloween props. There are also tons of photos of props with descriptions at Terror Syndicate. Terror Syndicate is where I initially found out about the Home Haunter’s Prop Building Handbooks. The Monster List of Halloween Projects List is probably the most comprehensive list of Halloween DIY projects on the web. It features around 800 different links to individual pages (some good…some bad) showing how to make your own Halloween props and decorations for your yard and home. Go to the bottom of the page for even more links specifically for the do-it-yourselfer — it’s an awesome, awesome DIY gateway link! 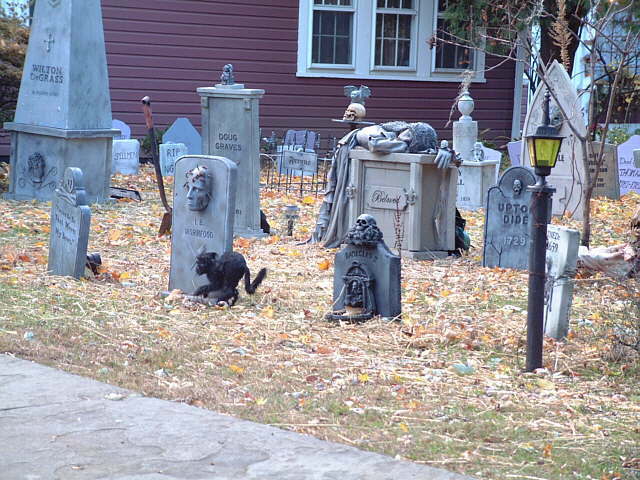 There is a homeowner and some neighbors in Brewster, NY who have teemed up together to create a yard haunt that will not soon be forgotten by all who visit. You’ll find all of the details at Brewster Yard Haunt. Kevin shows how he created some of the better props. Here’s a close-up look at the props that they have on display — with descriptions of each. Also, it would be well worth your time to check out their photo gallery of creative Halloween props. photos courtesy of Brewster Yard Haunt – thanks Kevin! Here’s a forum that’s filled with lots of like-minded DIY characters, such as yourself, where you can get help with your Halloween projects: Haunt Forum. By the way, you will need to register to participate, but that’s just how forums operate. If you want fast answers to your Halloween DIY questions, then it’s worth it! You can’t buy a corpse. (At least I hope not, anyway.) But you can make one! First, you’ll need a 4th quality skeleton — better known as a Bucky skeleton. 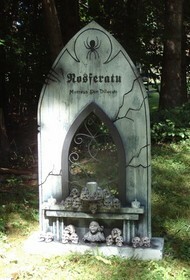 Next, visit Skeleton Store (the official home of Bucky’s Boneyard) to learn about the fine art of corpsification. There’s a fantastic web page from HorrorSeek that is labeled a Halloween Technology Roadmap. Basically, it’s a DIY haunter’s heaven (or hell, in this case). Props, sound, lighting… it’s all there for the taking! They’ve also got a handy index of Halloween prop projects. Devious Concoctions – shows you how to build your own… well, check ’em out. 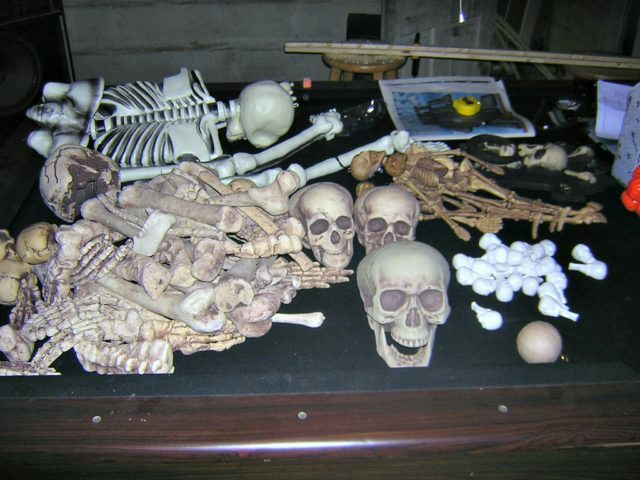 Ghoul Skool Props – shows you how to make all types of Halloween props yourself. The Yard Haunter has tons o’ tips for DIYers. Haunters Hangout has links to personal how-to pages listed by project type.